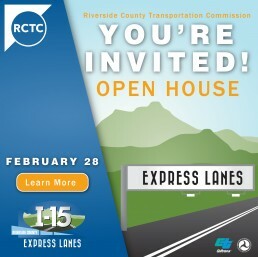 Construction began in early February on the first soundwall for RCTC’s I-15 Express Lanes Project. The wall will measure close to 14 feet in height and will be built along southbound I-15 and Bedford Canyon Road, extending south of El Cerrito Road for approximately .6 miles. Five additional soundwalls will be built for the project, all south of State Route 91. Click here to learn more and to view a map of the soundwalls approved for construction. Soundwall locations are determined by state and federal criteria. Outside noise levels must be 67 decibels or higher, and the wall must reduce noise by at least five decibels. Residents also must vote to approve the soundwalls in their neighborhoods. Walls will be built using concrete split-face block and will range in height from approximately 14 feet to 16 feet. Wall construction is planned to be completed in 2018 and 2019. To stay informed of soundwall work and overall project construction, please sign up to receive Construction Updates at 15project.info. In addition, the 15 Project will host a community open house on February 28 from 5:30 p.m. to 7:30 p.m. at Eagle Glen Golf Club to provide information about the project, including soundwall construction.